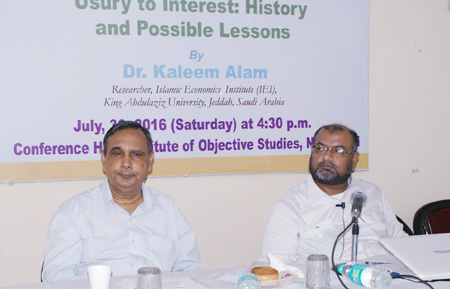 A lecture on “Usury to Interest: History and Possible Lessons” was organised by the Institute of Objective Studies at its conference hall on July 30, 2016. 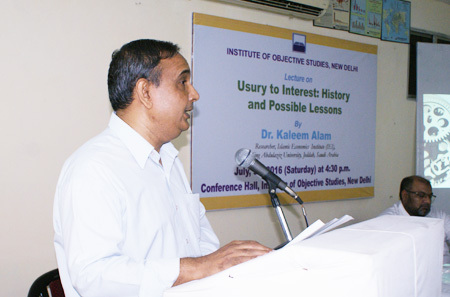 Delivering the lecture, Dr. Kaleem Alam, Researcher, Islamic Economics Institute (IEI), King Abdulaziz University, Jeddah, Saudi Arabia, observed that usury meant excessive interest charged on the borrower which was illegal and was prohibited. With the passage of time, those who traded or prastised usury were disliked by the society. This brought the clergy face to face with the rulers who became more assertive leading to the development from usury to interest. He explained that those who were in the business of usury were known as “usurers”. The Jews were known to be dealing in usury, though it was prohibited to them by Judaism. They continued to do the business as usual by interpreting religion in their own interest which, according to them, was permitted. They practised of usury while dealing with non-Jews. He maintained that Christianity was opposed to the practice of usury. 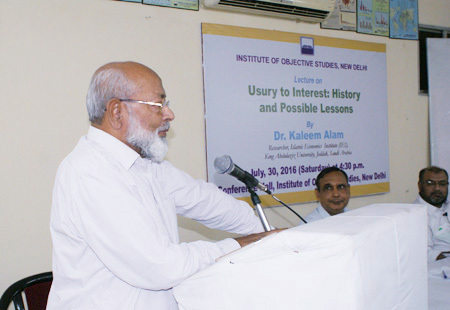 Dr. Alam pointed out that the Jews used to serve as bankers to the rulers. Usury was considered as an evil while interest had a different connotation. He said that the Jews and kings were looking for a way out of the impasse that was created due to usury. Thus came into focus interest which was defined as an extra amount paid on the principal borrowed amount. Tracing the history of interest, he noted that it was allowed as putting a limit on usurious charges. The charges were gradually reduced and eventually usury was abolished in 1854. Referring to the translation of both usury and interest in Arabic as “Riba” and “faiyedah” respectively, he sought to know why “Riba” should be replaced. He said that the term “sood” means in Urdu what “riba” did in Arabic. 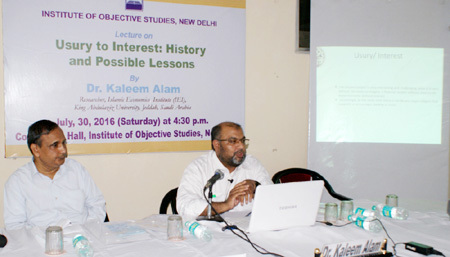 Introducing the topic, Prof. Javed Ahmad Khan of the Centre for West Asian Studies, Jamia Millia Islamia, held that there was a possibility of doing business in India in accordance with the Islamic banking system which was based on profit and loss sharing. He pleaded that in modern times when the global economy was based on inter-country trading, Islamic banking could not be viewed in isolation. He said that Islamic banking system attracted the attention of the developed countries in the wake of world financial crisis in 2008. He said that the fundamentals of the financial system had not changed as there was not much difference between conventional and Islamic banking. As far as India was concerned, there was no question of one community or the other but the rationality that was more important for introducing such a banking system. In his presidential remarks, the Chairman, IOS, Dr. M. Manzoor Alam, said that like any business, interest-free banking too required official permission in the country. Then there was the question of underhand practice which existed in the absence of proper permission from the government. But, in the case of micro-financing there were minimum conditions to secure permission from the government. Perhaps that was the reason why micro-financing turned out to be a flourishing business. The Islamic banking did not take off in India because the government did not allow it, he said. There was no dearth of hawks in the government to oppose the move. Commenting on the popularity of Islamic banking in today’s world he said that an eminent economist had predicted that there would be interest-free banking everywhere in the next 50 years. He noted that the previous government at the Centre had agreed in principle to allow Islamic banking in the country, but those with a communal bent of mind opposed the move and it remained a non-starter. While admitting that the real test of interest-free banking would come only when the licence to do business was granted, he said that the Islamic banking system had not as yet become fully operational even in countries like Malaysia and Indonesia. Bahrain, had, however, emerged as a country where experts in the field of Islamic economics were engaged in framing rules for interest free banking. He wondered where the system was not being honestly pursued in Muslim countries. Might be there were threats from certain influential countries to desist from introducing the Islamic system of banking. In our country where the Constitution guaranteed right to freedom of various kinds, a beginning could be made. Gujarat was said to be considered as the first destination of Islamic banking. If that happened, it would pave the way for other places in the country to follow suit, he added. Earlier, Hafiz Nazeerul Hasan recited a verse from the Quran. 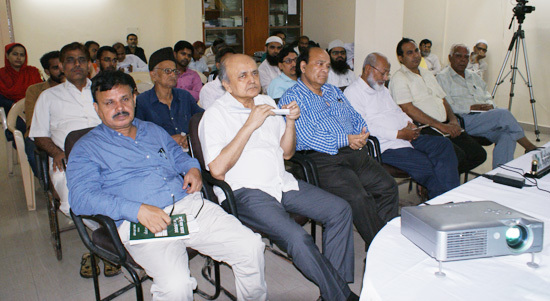 The lecture was attended by economists, researchers, university students and teachers, social activists and prominent citizens, including Chaudhary Nasir Ahmad, Md. Asad, Dr. Md. Ahsan Qureshi, Dr. Tariq Ashraf, Mumtaz Ahmad, Dr. Riyazuddin, Fasih Ahmad, Md. Mohsin, Ajmal Farooque Nadvi, Asrar Jamai and Safi Akhtar.